GOP presidential candidate former Gov. Mike Huckabee is criticizing the GOP leadership in the Senate for negotiating a debt ceiling increase that would include cuts to Social Security and Medicare with the Obama Administration. “I am greatly concerned about reports that Washington GOP leadership is negotiating a deal with the Obama administration to raise the debt ceiling, cut Social Security and raid Medicare,” Huckabee said in a press release. This is the same GOP congressional leadership that has failed to repeal ObamaCare, defund Planned Parenthood, stop the Iranian nuclear deal, build the Keystone pipeline, defend traditional marriage, secure the border, and reject Obama’s illegal executive amnesty. But now we should trust them to ‘reform’ Social Security and Medicare -in exchange for more deficit spending and endless debt? According to CNN, McConnell wants to limit benefits to the wealthy and increase eligibility age on Medicare and adjust the cost-of-living index to Social Security. 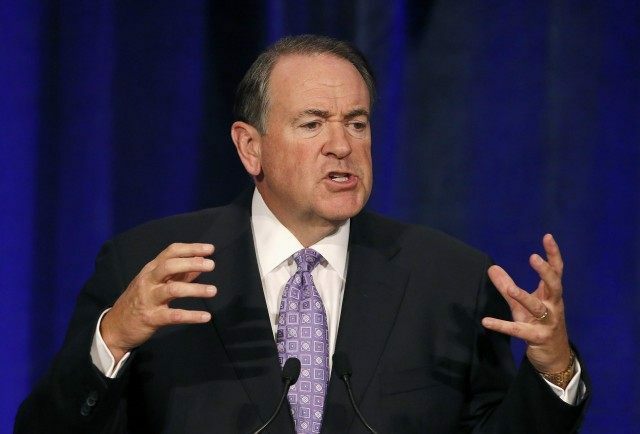 Huckabee went on to criticize Washington on ObamaTrade and the Trans Pacific Partnership (TPP) deal, saying the GOP should fight for conservative principles, not against them. Why should seniors be robbed of the benefits our government forced them to pay for? Why should our grandkids be enslaved with more debt because Washington refuses to balance the budget? I have a better idea: let’s kill ObamaCare, save Social Security, protect Medicare and pass the FairTax to grow our economy out of Washington’s bottomless pit of debt.